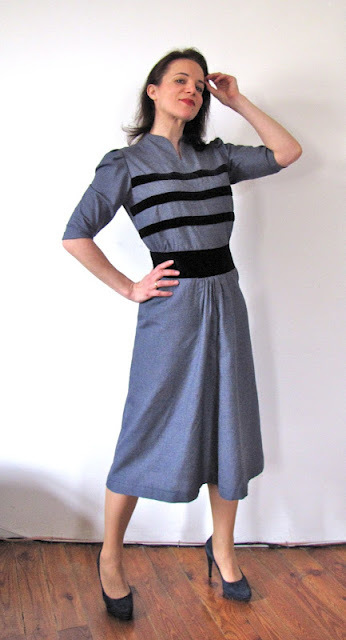 Of Dreams and Seams: The 1938 Dress: Finished! Vote and Win! 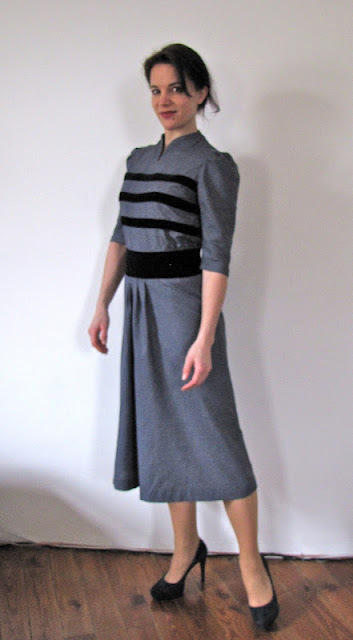 The 1938 Dress: Finished! Vote and Win! I was very unsure of how this skirt part would turn out - I had once tried a similar pattern and changed it entirely because I didn't trust that the "bunching up" of fabric in the center front was going to cut it for me. This time I went for it and I am liking it! 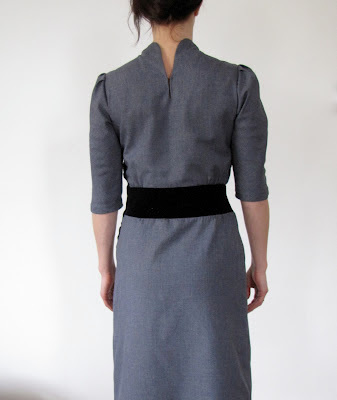 I like how it adds width to the skirt and still keeps the silhouette narrow, from front and back! By the way, one of the few things I changed from the original is that I didn't make the stripes on the back, as they would have in the original. With my short and rather wide back it would have been quite unflattering. The final post about that coat can be found HERE. I know the lengths aren't right, the skirt should be slightly shorter than the coat, but somehow I think it works that way, too. I tried to keep the dress quite original in its length. The proportions would have been strange and too modern had I made it as short as the coat - and like I said, I don't think I will be wearing it together much anyway. Would you please help me decide which one of these five options to sew? I will send a hand-copied pattern* to one of the commenters (chosen by True Random Number Generator) who votes for the one I end up making, i.e. the one with the most votes. Please be sure that I can contact you, so I can get your mailing address if you win. If you comment with a profile that will get me to your blog or email address, all is good. If you are anonymous, make sure you either leave your email address right away or subscribe to the follow-up comments and replies so you get the message if you won. The pattern will be in one size only, the one it comes in originally... I can't promise that I won't ever make the other patterns, but for now the one that gets most votes and that I am making first is the one that wins, ok? You can vote for up to two patterns, just in case you find it as difficult to decide as me... Voting is open utill April 1st!!! No ties are coming with this, you don't have to sign up for my blog, you don't have to follow me on my facebook or twitter, as I am using none of these platforms (facebook yes, but privately only). This really is only to help me decide. If you want to let others know about this, sure, feel free to spread the word. * I will also include any instructions - translated to English (unless you speak German) - and xerox everything in that magazine that has to do with the pattern. Here are the patterns, in historical order... So which decade will it be? 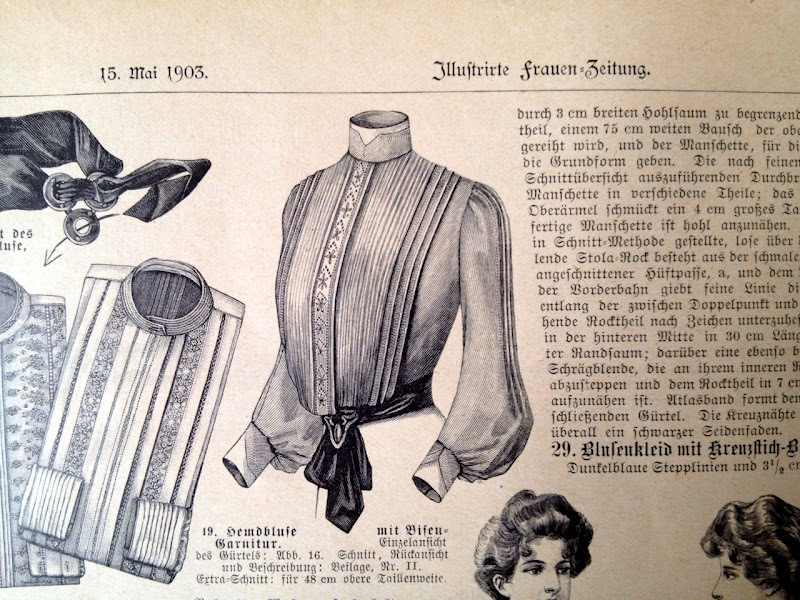 Option 1: A blouse from 1903, we'll learn about the pleating, tucks and possibly some embroidery detail etc... Don't you love the sleeves? And it comes with that belt you see on the top left. I am not sure what size this pattern comes in and it will be big time muslin-making. This would be the oldest pattern I've ever sewn up. Option 2: A striped blouse from 1916 with a white collar (yes, it's a double collar!) 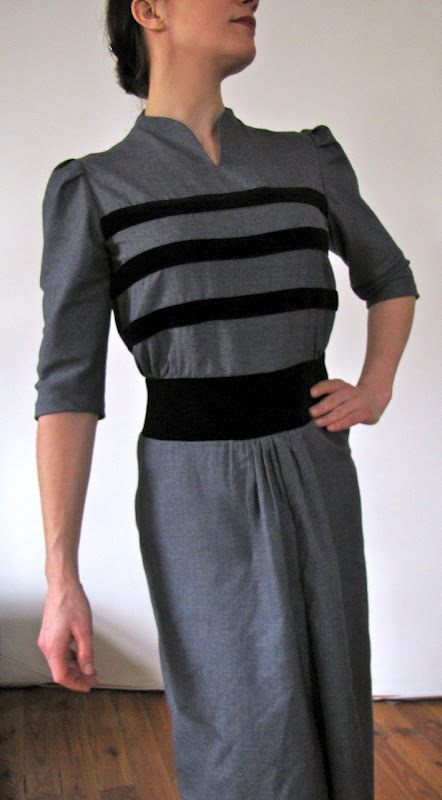 .I'll have to do some grading for this, as it comes in size III (Bust: 102cm/40 inches, Waist: 72cm/28inches, Hip: 110cm/43 inches), so we'll talk about that. I love the play with the stripes and I think it looks really modern! 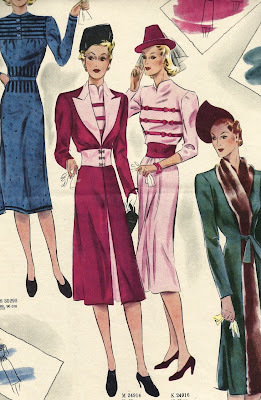 Option 4: A drop dead gorgeous pattern for a blazer skirt combination, from1949, very "new look", I will probably take several peaks into Gerties starlet suit jacket sewing class over at craftsy to make this! This comes in size I, which I believe is bust size 88cm/35 inches. So - which one will it be? I can't wait to hear your votes - I have a new commenting system, it should work for everyone now! If it doesn't work (...), and you still want to enter your vote, please send me an Email: dreamsandseams at gmail dot com. Best to all of you - thanks for being such a fabulous community! I think it has to be Option two, the striped blouse. It's superb. Closely followed by number three which is also awesome, but separates are more handy to have and I feel like no 2 is just perfection. Plus who could resist the stripes! Thanks for all your amazing blog posts, I've been scouring charity shops to find a men's suit to turn into your overall! Wo-hoo! Thank you for that first input and your lovely compliment! Please do let me know if you ever make the overall - I'd be happy to post your project if you want! Also, yes, the striped blouse... so cool, right? Katja, you are so talented! I love this dress and it appears you did an excellent job with the finishing. As for what should you make next, my vote is for option three. That white dress is sure to be lovely. However, not matter which one wins, I will be following along, eager to learn any new techniques that you share. I vote for option two. I really love the double collar and sleeves on there. :) I'd love to see a modern take on it. sneakfuzz at hotmail. Deine Werke sind ein wahrer Augenschmaus! Ich plädiere für das 3, Modell - einfach hinreißend! Your 1938 dress looks awesome Katja! The gathers look just fine - I too have made a vintage dress with gathers placed somewhere I normally wouldn't, right on my muffin lol, and I discovered it was really quite flattering! 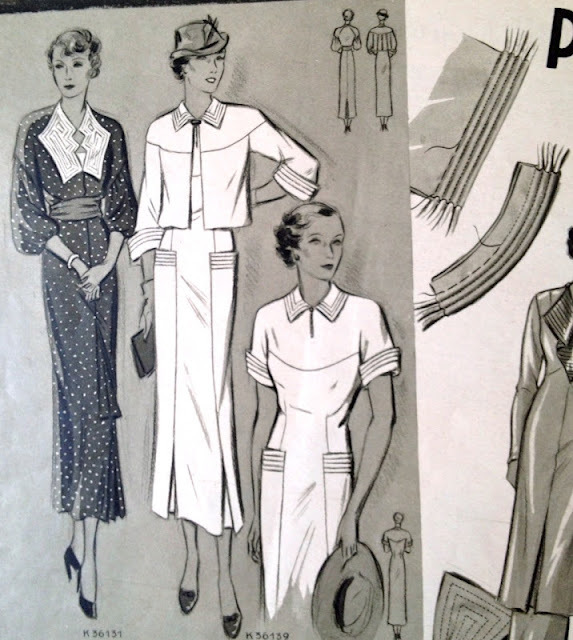 I'd love to see you make either the corded dress, or the striped blouse - that looks really interesting. I've been following your coat and dress saga for a while, and it's so exciting to see them together! 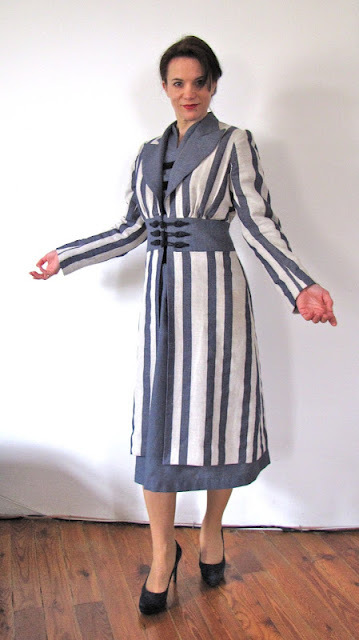 Did you ever figure out if you could show the pattern pieces for the coat? I love it so much; even to just see what the shapes of the pieces are like would help me in recreating it. That said, I love Option 2...I think I'm just a sucker for stripes! I love the stripes on your dress and the neckline. I say go for option 3! That dress is gorgeous!! Or option 5 - that is beautiful too. The dress+coat combo look awesome together! I think you should make either Option 4 or Option 5 but preferably Option 4. Don't enter me into the contest because I'm too impatient for tailoring and I think such a cool prize should go to someone that'll use it-but definitely count my vote for 4 please! Gorgeous coat & dress. I followed the RTW sew-along and admired your coat then. 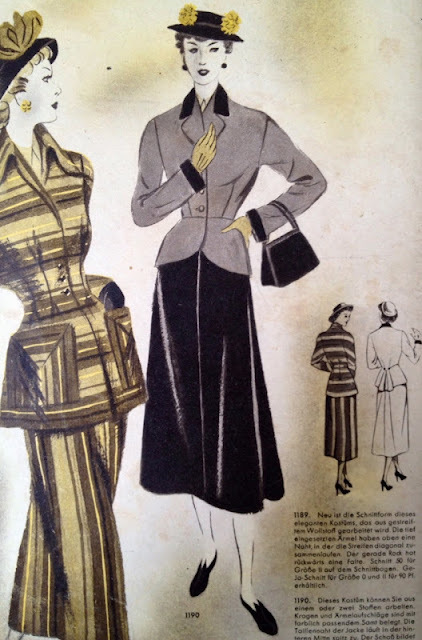 I adore number 3, the 1930's outfit. So gorgeous! The way they do seams then is so inspiring. (I must admit number 5 is stunning as well - those details on the front are lovely, and it would be a very close second choice.) I can see why you need help deciding with so many lovely options! Argh, still doesn't seem to work for everybody... harrietbazley added her vote over in my BurdaStyle studio. 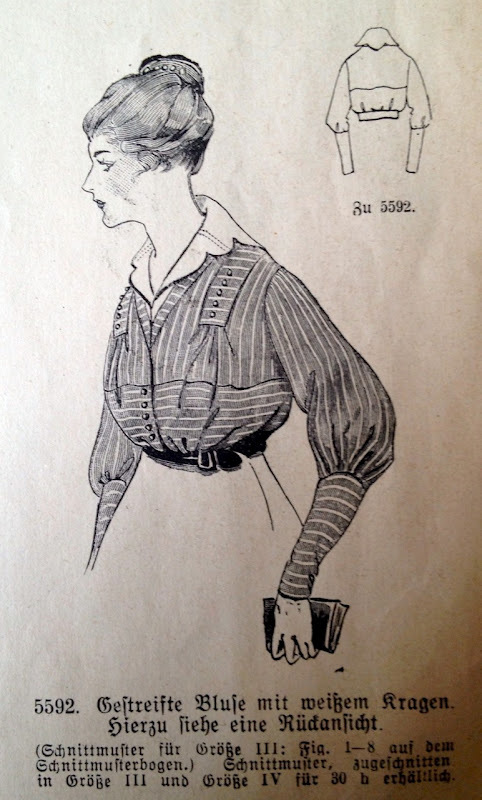 then the 1903 blouse, with all that pleating…." Da Du ein 30er Kleid eben abgeschlossen hast, votiere ich für die nächste Dekade. Die Jacke-Rock-Kombination von 1949 wäre mein Wunschkandidat. Deine Serien sind einfach klasse! 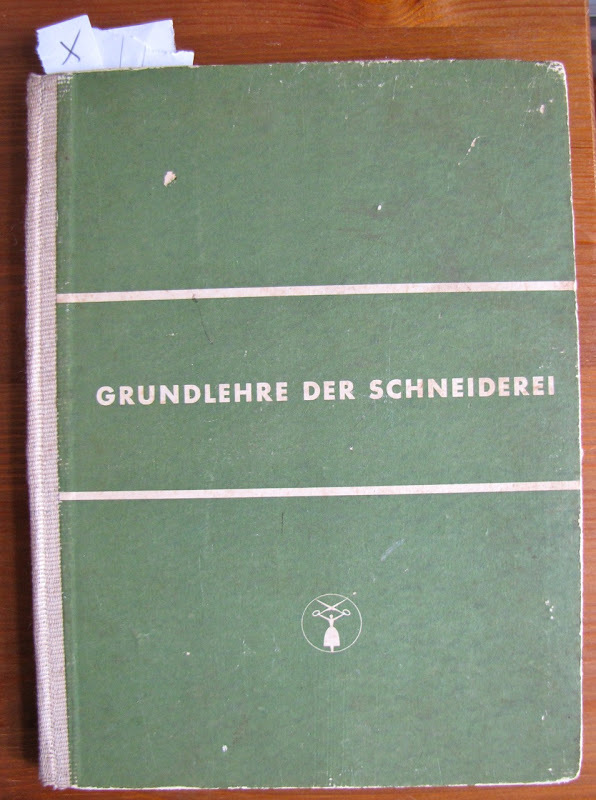 Aus den oben gezeigten Modellen würde ich das von 1952 auswählen, der Streifenverlauf gefällt mir besonders gut. I would prefer the blazer from 1952, I like how the stripes are running. Option 3 looks interesting for cording details, i wasn't knowing this at all, i mean on the picture it's make me thinking about a sort of making pipping but it's probably not really the same! I'm very curious to see your progress and learning on this technique and to see the result it can give on a garment. Of course the others options are interesting too, but the 3 caught my curiosity! I vote for option 2, the 1916 striped blouse! 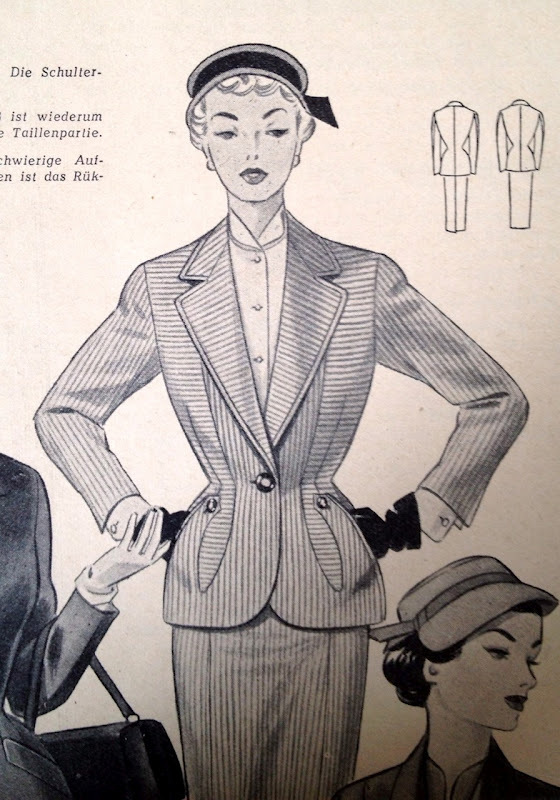 I agree that the alternating grain directions are modern and interesting, but I don't know how I feel about the double collar. 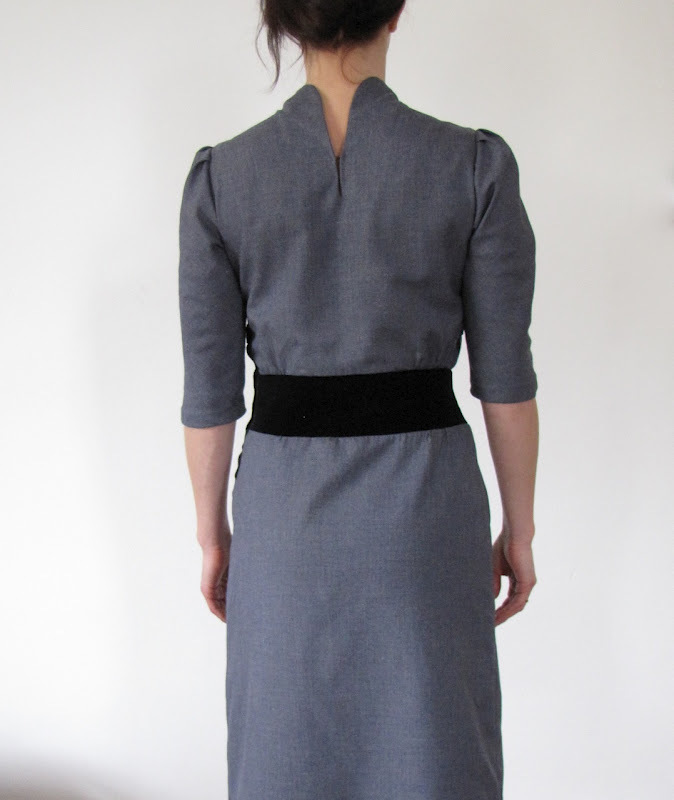 I do love that shoulder tab thingie, with the fullness coming out from under it. Your dress and coat are stunning. Thank you for the tutorial on the snap closures, I have several vintage re-issue patterns that have that option but I never really gave it any thought, I think I might try it sometime. I'm torn with my vote. Option #3 the white dress is lovely and I also am taken by Option #4 the stripe suit with the waistline tucks. Tough decision. WoW! So many to choose from I thought well this will be easy.... when I saw #1... I really do love that blouse! Then i saw... dress #3 w/jacket.... yep that's the one I choose... so pretty with so many beautiful details... and a jacket too! What's not to like? Oh my gosh, make option 5! It's so beautiful! Oh my! I really like all of them, but if I had to choose just one....it would be option #4! Can't wait to see what you make. Its hard to choose, but I will go with option 5. Mich würde erfreuen, die Nummer 3 ausgeführt zu sehen, oder als auch sehr interessant finde ich die 5. Bin gespannt, welche Stoffe du dafür aussuchst. I'm voting for option 4 or 5! I really want to know how what those seam lines are doing at the bottom of option 5... do the darts become pockets? Fascinating!! But the bargain-hunter in me says to go with 4 - it has a blazer AND skirt, bonus!! Slashing that Stash: Bathroom Rug Tutorial!